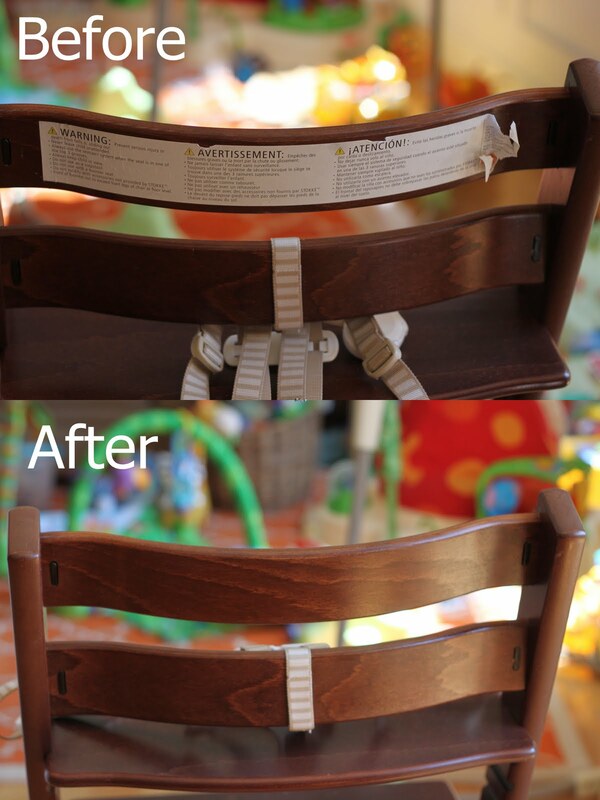 For over a year I have been staring at the back of Dash's high chair and thinking, "That sticker needs to go." I'm usually a stickler for removing stickers (heh), but somehow I didn't do this one when we set up the high chair, and this giant eyesore way outstayed its welcome. So the other day I started peeling. Because it was old and had been visited many times by a damp sponge, this didn't turn out to be one of those satisfying pull-it-off-neatly stickers. Goo Gone is the best. I don't know what's in the stuff, but it certainly delivers on the promise of its name. A few drops of the magic liquid on a paper towel and a little light wiping, and the gunk was history. Just another one of those things you're sorry you didn't do earlier.